That exploratory pitch is matched by the majestic Black Peak, named after a mountain top in Crete and, says Xylouris, “recorded everywhere”. A peak in both artists’ careers, the album testifies to their determination to stretch the scope of their instruments and forge something vigorously questing from more traditional roots. Where Goats was mostly instrumental, Black Peak gives Xylouris’s full-force baritone a lead role. And where Goats was often frisky, its tumultuous, tender and terrifically expressive follow-up drives harder and dives deeper. Partly, Black Peak pays testimony to both men’s remarkable histories. One of Crete’s best-loved artists, Xylouris is a scion of Greek musical royalty, a family from a mountain village near the Cave of Zeus. His father is revered singer / lyra player Psarandonis. A child when he began playing the lute, Xylouris would accompany his father in a backing role. Yet just as Psarandonis stretched the lyra’s range (“If music is measured in meter,” Psarandonis said, “I play in kilometre!”), so Xylouris elevated his eight-string laouto to the lead role in his Xylouris Ensemble. Jim White has commanded international attention for more than two decades as part of Australia’s Dirty Three, storm’s-eye instrumental diviners whose emotionally choppy soundscapes brim with elemental force. Now New York-based, White is often found collaborating with alt-A-listers (including: Bonnie ‘Prince’ Billy, PJ Harvey, Nina Nastasia, Cat Power and Smog,) where his playing redeploys the rolling momentum of free-jazz to supple ends, from sensitive to seismic. PJ Harvey has likened White’s playing to dancing. Yet if dancers need partners, Black Peak also pays testimony to a friendship forged over 25-plus years. Xylouris was touring with his Ensemble when he met White in Melbourne in the early 1990s, when the drummer was in his pre-Dirty Three avant-rock outfit Venom P Stinger. In retrospect, a cycle of influence emerges: Xylouris’s 1990s live contributions to the Dirty Three seem to set a blueprint for Xylouris White, yet the Dirty Three were themselves inspired by Xylouris and Psarandonis. This fluidity is clear from the rolling explosion of the title-track, where White’s thunderous rhythm seems to urge, and be urged along in turn, by Xylouris’s chugging lute-rock riff, pirouetting melody and soaring vocal. “Forging” maintains the momentum, Xylouris’s thrashing, thrilling lute melody circling the rock of White’s pulsing drum. Elsewhere, Xylouris White re-write their route map. “Hey, Musicians” is rich and sonorous. The skin-tingling crawl of “Erotokritos (Opening)” draws on romantic renaissance verse; “Short Rhapsody” is a joyous jam of slashing laouto and coiled percussion; “Pretty Kondilies” is dancing and declamatory. Finally, “The Feast” sprawls gorgeously between tradition and invention, its sombre, sighing spaces shared with guest star Psarandonis’s stunning lyra and voice. 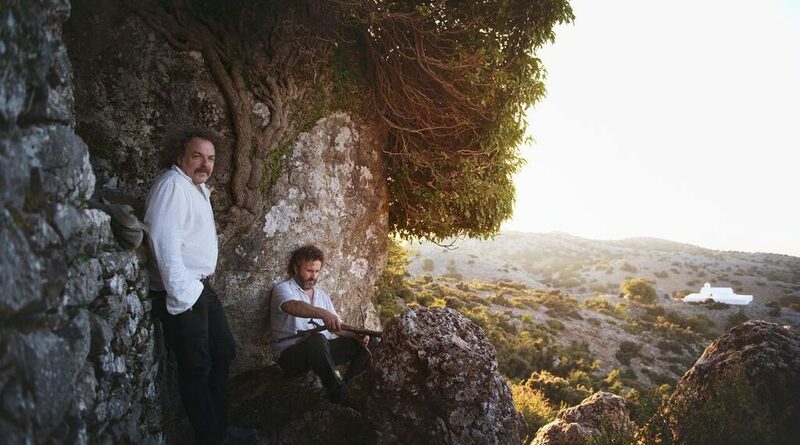 It took until 2013 for Xylouris and White to form as a duo, a process accelerated when White played with Xylouris and Psarantonis at a Nick Cave-curated All Tomorrow’s Parties festival in Australia. Just as other parties helped unite them, so the path to Black Peak was trod with support. The producer is Fugazi’s Guy Picciotto, as on Goats (Xylouris: “His enthusiasm and aesthetic bring richness to the proceedings.”); the ghostly harmonies on “Erotokritos” come from Bonnie ‘Prince’ Billy. “All these things together, Jim from Australia, me from Crete, Bonnie ‘Prince’ Billy from Kentucky, Psarantonis from Crete, Guy Picciotto from Washington give us the inspiration of the horizon,” says Xylouris. “Jim and I travel a great deal and we like to do so. We have been doing that together the past three years, which is what inspired us to think of the horizon. “We’re still goats,” he adds, “now on the horizon.” On the spectacular Black Peak, Xylouris White show just how far their horizons can stretch.